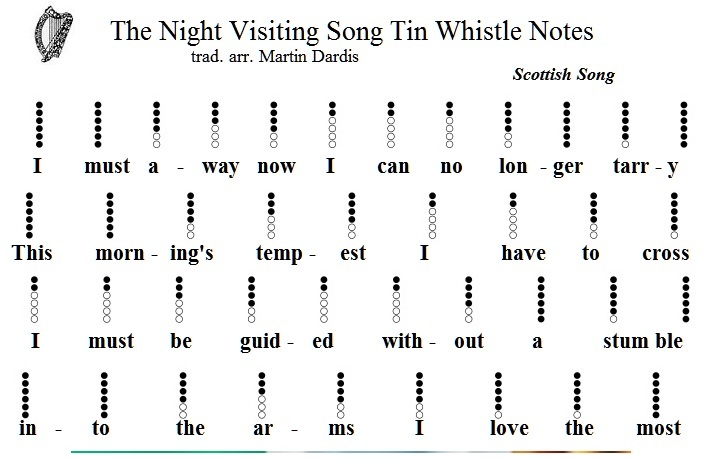 The Night Visiting Song Tin Whistle Music Notes. A trad. Scottish song recorded by Luke Kelly and The Dubliners. I recommend anybody whose just starting to play the whistle to start with this song if you already know the tune. It's one of them songs that just uses 5 notes and yet you wouldn't think your only playing such a small number of notes. It only goes from the D up to the A and yet sound good. I also included the piano / keyboard notes in a different key for beginners, they are all white notes.